I received an email from Capital One stating that one of my credit cards was set up to receive Capital One Deals. You don't need to sign up to receive these deals, they are automatic. You can receive the deals via email or you can get it through their app for iPhone® or Android™. Download today at the App Store or Google Play. You will receive credit within 10 days of making your purchase which you will be able to see when you log in to your Transactions & Details page of your Capital One Account. The deals below will expire at the end of May and deals will be sent out on a weekly basis. I do wonder if one could purchase a gift card with this deal. The terms don't seem to indicate that it wouldn't be possible. Let me know if you do buy a gift card and receive the credit. When your Capital One Credit Card has been added to this program you will receive an email from them, so look out for their emails! Will you be taking advantage of these deals? I would love to hear from you! FreeMonee™ Gift—money to spend at this merchant. There’s no minimum purchase, and you don’t have to use it all at once as long as you use it before it expires. To redeem this offer, you will need to spend a minimum of $50 at The Home Depot, including taxes, but after any additional discounts. Offer valid in-store or online for one purchase. To redeem this offer, you will need to spend a minimum of $12 at Pizza Hut including taxes, but after any additional discounts. Offer only valid at standalone locations or online for one purchase. Offer not valid at Pizza Hut combination stores. To redeem this offer, you will need to spend a minimum of $75 at Naturalizer, including taxes, but after any additional discounts. Offer valid in-store or online for one purchase. To redeem this offer, you will need to spend a minimum of $30 at Kmart including taxes, but after any additional discounts. Offer valid in-store or online for one purchase. 1. What is Capital One Deals? Capital One Deals is a new program giving personalized money-saving deals to selected Capital One credit card accounts. Once your card is selected, your deals will be e-mailed to you each week and shown in your Capital One mobile banking app. Then just shop and save on things you already like to buy. No coupons or anything to show at checkout! The deals will indicate if they can be used in-store, online, or both, and your savings will appear as a credit on your account balance within 10 days from the date of purchase. 2. How can I participate in the Capital One Deals program? Capital One Deals is a new program. If you received an e-mail about the program from us, then you’re already selected. If you haven’t, this feature isn’t available on your account at this time. We plan to add more credit card accounts in the coming months, and we’ll e-mail you as soon as your card is selected. After that, we’ll send you weekly e-mails with deals selected especially for you. 3. How do I know what my deals are each week? Once your card is selected to participate in the Capital One Deals program, we'll send you weekly e-mails with deals especially for your selected Capital One card account. Your available deals will also be shown in your Capital One mobile banking app. 4. Is there a fee to participate in the Capital One Deals program? No, there’s no additional fee to participate in the Capital One Deals program. 5. Where can I track my Capital One Deals and account credits? 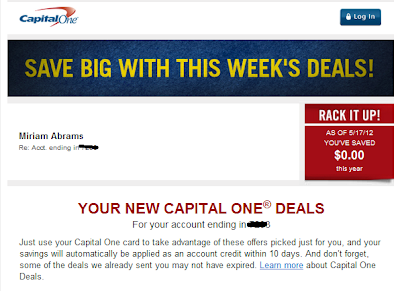 Your weekly Capital One Deals are provided to you through your weekly deals e-mail. To track your savings, simply log in to your Transactions & Details page for the account that’s participating in Capital One Deals. Savings from Capital One Deals will appear as credits in the Amount column of that account. The Description column will feature the merchant name, followed by "Capital One Deals" (example: T-Mart #123456, Baltimo-CAPITAL ONE DEALS <$3.00>). It can take up to 10 days for credits to appear on your statement. For added convenience, you can track your savings on your Capital One Mobile app. 6. I have more than one Capital One credit card. Does it matter which one I use to take advantage of my deals? Yes, because offers from Capital One Deals are tied to specific credit card accounts. You must use that account to receive the savings. 7. My Capital One rewards card is part of the Capital One Deals program. Do I still earn the rewards associated with my card on purchases I make affiliated with one of my Capital One Deals? Yes, you’ll not only save money with your offer from Capital One Deals, you’ll also receive the rewards you normally earn on that same purchase, as long as it’s a rewards-qualifying purchase. 8. Can I use coupons or other special offers and still take advantage of the deal? Yes, you can use coupons or other special offers as long as you spend the minimum amount required by a Capital One Deal. 9. Will my savings show up on my store receipt? No, your savings won’t show up at the register or on your store receipt. Instead, it will appear as an account credit on your selected Capital One credit card account within 10 days of your purchase. 10. Do I need to reference the particular deal at check out in order to get the credit? No, whether the deal is for an online or in-store purchase, you don’t need to do or say anything differently than a normal purchase with your selected card to enjoy your savings. Simply meet the minimum requirements stated in the deal, and your account will automatically be credited with your savings within 10 days. No coupons to show or promotion codes to enter! 11. What is a “FreeMonee gift”? FreeMonee gifts are Featured Deals in the Capital One Deals program provided through Capital One's service provider, FreeMonee. A FreeMonee gift offers savings for a specified dollar amount to spend at a selected merchant. There’s no minimum purchase requirement, and you don’t have to use it all at once, however, you must use it all before it expires. The savings will be applied as an account credit. 12. I don’t want to receive any more deals. How do I opt out of the Capital One Deals program? The deals are a feature of your card, and you can’t opt out of the program. But like any Capital One marketing e-mail, we always provide you with an easy way to opt out of receiving marketing messages from us. Please be aware, if you opt out of these weekly deal e-mails, you’ll be opting out of all Capital One marketing e-mails, which may result in your missing some really great offers and chances to save. If you still want to opt out of receiving your weekly deals e-mail, please visit our online servicing page for more details, or click the “Unsubscribe” link in your weekly deals e-mail. 13. Why did I receive an account credit from Capital One Deals? Capital One Deals is a feature of select Capital One credit card accounts. If you made a purchase that qualified for the terms of one of your deals, you’ll automatically receive the credit listed in the deal, even if you weren’t aware of the deal. When your card is selected for Capital One Deals, you’ll receive weekly e-mails letting you know which new deals have been selected for you. If you haven’t received an e-mail from us about your deals but you see a Capital One Deals credit on your account, check your spam folder to see if you missed an e-mail from us. You can also visit the Capital One online servicing page to check that the e-mail address listed for your account is correct. 14. Why does it take up to 10 days to receive my credit? Though it usually takes less than 10 days, in order for your credit to appear on your account, we have to receive the purchase transaction from the merchant and post it to your account. We aim to post your credit to your account as soon as possible, but completing these steps could take up to 10 days. 15. If I used my card more than once for a deal, why won’t I get the credit again? Many deals are valid for one purchase only, and for those deals, our system will only award the credit once. Carefully read the terms and conditions for each deal to learn if you can use it more than once. Usually only a Featured Deal can be enjoyed over multiple purchases. 16. Can I use these account credits as a payment towards what I owe on my credit card balance? Account credits earned through the Capital One Deals program will reduce your balance, but don’t count toward your minimum payment. Please make at least the minimum payment specified on your account statement by the due date.